Saudi Aramco and Sumitomo Chemical started the Petro Rabigh Project with the aim of building integrated oil refining and petrochemical operations by way of upgrading Saudi Aramco’s oil refinery and constructing a new petrochemical complex. A joint venture agreement was signed between Saudi Aramco and Sumitomo Chemical in August 2005 and Petro Rabigh was established, an equally owned joint venture to run the Rabigh complex, in September of the same year. Construction commenced in March 2006, with a planned investment totaling US$ 9.8 billion – approximately 60% of which, or US$5.8 billion, was procured through project finance. 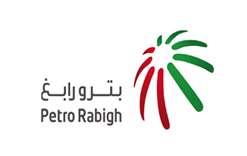 In January 2008, Petro Rabigh held its initial public offering (IPO) on the Saudi Arabian stock exchange, and this changed the ownership of the company by Saudi Aramco and Sumitomo Chemical to 37.5% each. In October 2008, Saudi Aramco transferred its oil refinery to Petro Rabigh, and the newly completed Rabigh complex began operations in April 2009.